West Yorkshire Fire and Rescue Service, and West Yorkshire Police hold aroad safety event at Tesco Halifax car park, Aachen Way, King Cross. Lisa Muscaella, Jonathan Firth, Toby May, Geoff Morritt and Phil Hall. Officers from Calderdale’s Police and Fire and Rescue teams have been demonstrating the results of serious road traffic collisions at a joint partnership road safety display. The event at the Tesco Store at Kings Cross, was delivered by officers from the police and fire service who used cutting equipment to show what measures they have to take in removing people from vehicles following a collision, as well as detailed advice for motorists around all areas of road safety, inside and outside their vehicles. 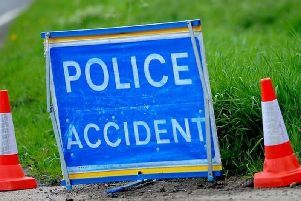 Calderdale police sergeant Jonathan Firth said: “The scenario of having to be cut from a vehicle after a collision is one that we hope most people never have to endure, however it serves as a stark warning to motorists to drive safely and to the conditions of the road. WYFRS published the Calderdale District Performance Monitoring Report for April 1 2014 to March 31 2015.
the report found that Calderdale contains a long stretch of the M62 motorway and several other major road carriageways. The likelihood of serious road traffic collisions is therefore particularly high within the district. The service, however, managed to beat the 2014/15 target set for road traffic collisions by 22.2 per cent.